Now this is creative - Flickr User and Lego fan Finn Tegotash made this brilliant recreation of Bilbo's confrontation with Smaug in The Desolation Of Smaug, building Smaug's lego-y face out of a cavalcade of brown pieces - including scales created built out of little lego chair pieces. His eyes - actually the eye of Sauron found inside Lego Saruman's palantir - even light up! I also particularly love the use of string threaded between the Lego base to recreate dwarven runes (they read 'Smaug' apparently). From top to bottom, this is a pretty bloody fantastic display! 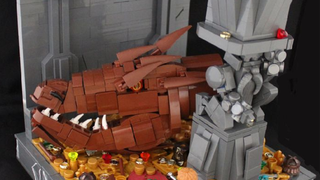 Also, a million times better than the Lego Smaug we actually got.